Spezi is the brand name for a soft drink owned by Brauhaus Riegele in Augsburg. 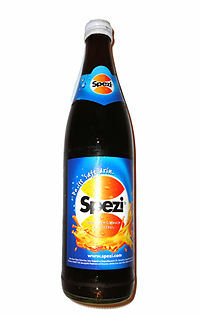 Spezi is a genericized trademark and the name is used as a generic term for a mixture of Cola and orange soda in most German speaking countries. When the brand was registered in 1956, Riegele at first was selling beer under the trademark. Since the 1970s, Spezi is produced and bottled by different local breweries under a franchising agreement. The first Original Spezi Cola Orange TV commercial aired in 1989. Most large beverage manufacturers sell similar products, though most of them only in Germany, Austria and Switzerland. Examples are Schwip Schwap by PepsiCo or Mezzo Mix by the Coca-Cola Company though most grocery store chains sell generic brand versions of the drink as well, usually called "Cola-Mix". Riegele Spezi is sold mostly in half liter glass bottles, but 0.33 l and 1.5 l bottles are available as well. Spezi contains Water, glucose-fructose syrup, sugar, orange juice concentrate (2.3%), lemon juice from lemon juice concentrate (0.8%), carbon dioxide, caramel color, phosphoric acid and citric acid, natural flavoring, caffeine, citruse extract, locust bean gum (stabilizer). There are also different version, including a sugar free one. In some regions of northern Germany (Emsland), Spezi stands for a mixture of traditional German Schnapps and cola. Similar to that, there are other local attributions to the term. In Croatia, the term speci is used to describe a similar drink.